Madrid has not escaped escape the charms of Japanese street food and the famous ramen. Here in Konnichiwa you will try what the Japanese eat in Tokyo. 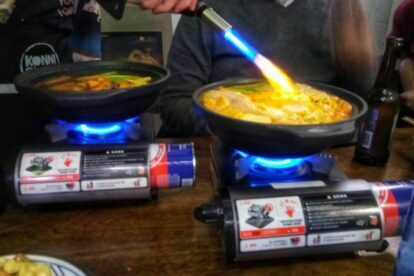 The pots or hot pots are on most of the tables, nobody wants to miss the Konnichiwa pot which takes special powders (this ramen is based on concentrate). They prepare this recipe for you at your table and they explain the ingredients they add into it. The peak of the preparation is when they cook an egg on the noodles with a blowtorch. While that is happening, you can eat some delicious gyozas (my favorites are the vegetables stuffed with finely chopped chives and a little garlic), which are steamed, but have a crunchy finish. The menu has options for all tastes, from rice all the way to meat. Not everything is soup. The desserts are special: there is one that is a small cake in the shape of a fish, filled with red bean paste, or the popular moshi. They also have Japanese beer to accompany this medley of flavors. The feeling here is fun, because you feel you are not in Madrid, but when you leave you are in the middle of the busy Fuencarral street. It’s Tokyo street cuisine closeby, without a plane ticket!